America can’t get past its zombie obsession. We have more zombie movies, TV shows, and video games than ever before – we zombified versions of action figures, superhero comics, and Jane Austin novels. 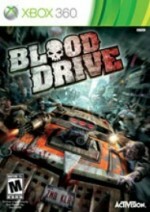 And now we have Blood Drive, a zombified Twisted Metal rip-off. While running over hordes of undead in cars built to shred steel and bone isn’t a terrible premise, this killer car combat title is as fun to drive as a classic car that’s been trashed by years of neglect. After the zombie apocalypse, the Vegas-like town of Las Ruletas plays home to a car combat reality show starring a group of mentally disturbed caricatures so out-of-this-world that they’d be out of place on a WWE pay-per-view event. These Blood Drive tournaments are vehicular gladiatorial matches where contestants battle each other across obstacle courses littered with the undead. The tone is playful, and the subject matter is ripe for comic mischief, but the story is superficial at best and we’re given little context for each event. Since there really is no story, and the single-player game only consists of timed challenges and tournaments with AI racers, the offline experience is nearly the same as what you’ll find online (good luck finding online opponents, by the way). Blood Drive has a mixture of challenges: explosive destruction derbies, checkpoint races, and score competitions that require you to run over the most zombies. However, they begin to feel repetitive after a few hours. The game’s mix of weapons is unbalanced, but the bigger problem is how these Frankenstein vehicles control. Most of the cars take corners about as well as a shambling corpse, and the smaller, more agile vehicles have trouble standing up to the more tank-like trucks. You need to be able to absorb a lot of damage, because you won’t be dishing out too much of it. Aiming – or even driving in a straight line – is often a challenge. If you hit so much as a pebble, your car ends up jerking off-course. Bigger collisions can send you floating into the air for several seconds, making you an easy target for the hawkeyed AI. Anyone looking for a quick car combat fix before next year’s Twisted Metal might be able to waste a few hours on this title, but they won’t be wholly enjoyable hours. Since you can’t save in the middle of a tournament, and some the later cups last a couple hours, the game eventually tests your endurance. I’d rather give bone marrow than sit through this Blood Drive again. drive as a classic car that’s been trashed by years of neglect.